2006 March 1: A Russian Proton M rocket failed to deliver a commercial communications satellite into proper orbit rendering it useless. The Proton M rocket equipped with a Briz-M upper stage and carrying the Arabsat-4A comsat blasted off from Pad 39 at Site 200 in Baikonur Cosmodrome at 2:10 a.m. local time on March 1, 2006, (20:10 GMT on February 28, 2006). According to International Launch Services, ILS, (a Russian-American joint venture which markets the launch vehicle outside Russia), preliminary flight information indicated that the Briz-M upper stage shut down prematurely during its planned burn sequence. "As a contingency," the satellite was separated from the upper stage, ILS said. As of February 28, 2006, the company could not comment on the fate of the spacecraft. However a US tracking radar detected the satellite in a 507.7 by 14,695-kilometer orbit with an inclination of 51.52 degrees toward the Equator. Such parameters show that the Briz upper stage initiated its second firing, intended to lift the satellite from its low parking orbit into a highly elliptical orbit, which would become circular and Equatorial after subsequent burns. The failure apparently took place at the end of the second burn. (The upper stage burn was some 200 seconds short of the planned 30 minutes). In a nominal flight, the Briz-M would release the spacecraft in a 3,150 by 35,786-kilometer orbit with an inclination of 14.2 degrees. Russian sources estimated the possibility of salvaging the satellite as very low. The mission was previously expected in December 2005 and was once scheduled for February 21, 2006. On March 2, 2006, Roskosmos said that despite the latest failure, there was no need for the formal "grounding" of the Proton launch vehicle. At the time, the nominal schedule called for the next launch of a Proton on May 17, 2006. On April 26, 2006, ILS issued a statement saying that The Russian State Commission had completed its investigation into the failure. The commission concluded that an anomaly in the oxidizer supply system caused the Briz-M upper stage main engine to shut down prematurely. Based on telemetry data, the most probable cause of the oxidizer supply interruption was a foreign particle blocking a nozzle of the booster hydraulic pump, the commission stated. Flight operations should be able to resume after corrective actions have been implemented, the commission stated. Implementation of such steps was expected by the end of May 2006. According to post-flight data released by ILS, at 5,536 seconds after liftoff of the ill-fated mission, during the second burn of the Briz-M, an unplanned main engine shutdown occurred. In accordance with standard procedures, the flight control system produced an emergency command, and at 5,541 seconds after liftoff the spacecraft was separated from the upper stage, into an orbit with 51.5 degrees inclination, 14,679 km apogee altitude and 506 km perigee altitude. The State Commission reviewed all possible failure scenarios based on telemetry data received from the Briz-M upper stage. To verify possible scenarios, various units have been tested in test stands, including test firing of the main engine. The commission was developing corrective actions for additional inspection of the Briz-M and Briz KM main engines, which are of the same type, to prevent recurrence of similar anomalies. Concurrently, the ILS Failure Review Oversight Board was to commence a series of meetings in Moscow. The FROB was expected to review the final report and corrective action plan in accord with U.S. and Russian government technology control regulations, with the goal of completing its work by the end of May 2006. For the second time since the beginning of the year, a Russian rocket has launched a celestial show for observers on the ground. During the night from February 19 to 20, 2007, Ray Palmer, an Australian astronomer was conducting long-exposure photography of the night sky, as he noticed a round object between the Centaurus constellation and star Spica. 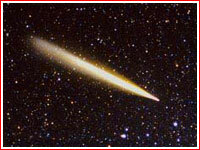 "(It) reminded me of Comet Macholz (only larger and brighter! )… and seemed to have a nucleus," Palmer said in an e-mail communication with RussianSpaceWeb.com. The astronomer then re-targeted his telescope to shoot the mystery object, which was blinking on and off, a telltale sign of a tumbling orbiting spacecraft. Palmer was able to track the object for about 35 minutes, (until around 2:50 am on Feb. 20, 2007), as it was slowly fading in the sky over Western Australia. It took two days of debate in the astronomical community to finally identify the object as a the spent Briz-M upper stage from the ill-fated mission of a Russian Proton rocket in February 2006. The inactive vehicle tumbled through space until the night of February 19, 2007, when leftover propellants inside the stage apparently overheated and exploded over Australia, with Ray Palmer being in the right place and at the right time to capture the event. This is apparently the only instance of the spontaneous explosion of a spacecraft being photographed, however events of this sort are known in the history of space exploration. In the meantime, ABC Australia reported that numerous residents of the Darling Downs in Southern Queensland contacted the station to report a milky glowing cloud and lights moving slowly across the night sky between 3 am and 4 am local time. Radar apparently detected more than 500 fragments in the aftermath of the explosion. Remarkable images by Palmer and his colleagues in Australia appeared on a popular Spaceweather.com web site, opening a floodgate of e-mails to Palmer from mass media and NASA. In January, the fiery reentry of the upper stage of the Soyuz-2 rocket, which delivered the Corot observatory, was widely observed in North America. 2006 June 18: Less than four months after its latest failure, the Proton rocket resumed its missions with the successful launch of the first satellite for the government of Kazakhstan. A Proton-K rocket with Block DM-3 upper stage blasted off from Pad 39 at Site 200 at Baikonur Cosmodrome on June 18, 2006, at 01:44:05.003 Moscow Decree Time, carrying the KazSat communications satellite. The upper stage and its payload separated from the third stage 9 minutes 28 seconds after launch. Following a successful orbital insertion, the payload separated from the upper stage at 08:32:33.626 Moscow Decree Time, according to Khrunichev enterprise, which developed the spacecraft and the launch vehicle. In a rare appearance in Baikonur, the Presidents of Russia and Kazakhstan personally watched the launch accompanied by the head of the Russian space agency, Roskosmos Anatoly Perminov. 2006 Aug. 4: A Proton-M launch vehicle with a Briz-M upper stage lifted off from Pad 39 in Baikonur Cosmodrome on August 5, 2006, at 01:48 Moscow Time (21:48 GMT on August 4). The vehicle carried the Hot Bird-8 communications satellite into the geostationary orbit for the Eutelsat of Paris. Built by EADS Space, the 4,875-kilogram HOT BIRD 8 is based on the consortium's Eurostar E3000 platform. The Multipurpose Ku-band communications satellite was designed to provide 950 TV channels and 600 radio stations to cable and satellite-equipped homes in Europe, North Africa and the Middle East, as well as Russia and Kazakhstan. The largest spacecraft in the Eutelsat fleet, HOT BIRD 8 carries 64 transponders and is expected to work for 15 years. The satellite’s was expected to replace 20 transponders on the HOT BIRD 3 satellite, which will continue service at a new location. In conjunction with HOT BIRD 7A, which was launched in February 2006, it was also expected to contribute to raising in-orbit redundancy in Eutelsat’s HOT BIRD neighborhood. Some 12 minutes after the launch, International Launch Services, ILS, which markets the Proton rocket worldwide, confirmed separation of the Briz-M upper stage and its payload from the third stage of the launch vehicle and first ignition of the Briz-M upper stage. After a total five burns of the Briz-M upper stage and nine hours 11 minutes after launch, HOT BIRD 8 successfully separated in a 35,786 by 3,800-kilometer orbit with an inclination of 13 degrees toward the Equator at 06:59 GMT on August 5, 2006. Eutelsat confirmed that its ground control station in Rambouillet near Paris, France, had successfully acquired signal from the satellite. The satellite was expected to use its own propulsion system to enter its final orbit, positioned 13 degrees East over the Equator. It would also deploy its solar panels and antenna reflectors, which were to follow by a series of in-orbit tests, Eutelsat said. 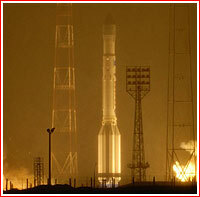 The contract for this mission of the Proton rocket was announced on Feb. 10, 2005, and at the time, the launch was expected in the first quarter of 2006. The launch was later re-scheduled for May 17, July 7 and July 21, 2006. The payload arrived at the Baikonur Cosmodrome on July 6, 2006. 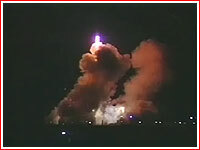 2006 Nov. 8: A Proton-M rocket equipped with a Briz-M upper stage blasted off from the Baikonur Cosmodrome's Pad 39 at Site 200 on November 8, 2006 at 23:01 Moscow Time. It carried the Arabsat-4B communications satellite built by EADS Astrium of France. The 3,304-kilogram spacecraft based on the Eurostar 2000+ platform carried 32 transponders and is designed for a 15-year nominal lifetime. It is to be positioned in a geostationary orbit 26 East longitude over the Equator. This launch was originally scheduled for September 22, 2006. 2006 Dec. 12: A Proton/Briz-M launch vehicle successfully placed the MEASAT-3 satellite into orbit today, for the final mission of the year for International Launch Services (ILS). The launcher lifted off at 5:28 a.m. local time (6:28 p.m. EST; 23:28 GMT on December 11). The payload was released into a geosynchronous transfer orbit 9 hours and 12 minutes after a liftoff. This was the fourth Proton mission of the year for ILS. ILS has exclusive rights to market and manage missions on the Russian Proton vehicle for commercial satellite customers worldwide. The satellite is a 601HP model built for MEASAT Satellite Systems (MEASAT) Sdn Bhd by Boeing Satellite Systems International Inc. From its final orbital position at 91.5 degrees East longitude, MEASAT-3 was to serve customers in more than 100 countries at C-band and in Malaysia, Indonesia and South Asian with DTH-quality Ku-band coverage. This was MEASAT's first launch on an ILS Proton vehicle, as well as the 10th 601 model spacecraft launched on Proton. The agreement for this mission was announced on Sept. 4, 2003 and at the time launch was expected in May 2005. It was then postponed to the third quarter of 2006. 2006 Dec. 25: A Proton-K rocket with Block DM-2 upper stage blasted off from Baikonur Cosmodrome on Dec. 25, 2006, at 23:18 Moscow Time, carrying a trio of spacecraft for Russia's global positioning system, GLONASS. According to the official ITAR-TASS news agency, the spacecraft successfully reached orbit at 02:50 Moscow Time on December 26, 2006. The satellites were still expected to use their own propulsion systems to reach final operational orbits. Artist rendering of the HotBird-8 spacecraft in the geostationary orbit. Proton-M launches HOT BIRD 8 on August 5, 2006. The Proton rocket launches Arabsat-4B on November 8, 2006.